The book follows the journey of G.S. Garcia and J.M. Capriola, two legendary saddle makers in northeastern Nevada who made their living from the working cowboys and ranchers in the Great Basin. Entering into the present are the Bear and Wright families who have chosen to continue the tradition and heritage of leather craftsmanship. Today, customers entering the J.M. Capriola Co. are met with the same smell of leather that greeted G.S. Garcia’s patrons over 100 years ago. The book is 130 pages with 300 photos, many never seen before. At the Garcia Harness and Saddlery, G.S. was the leather cutter for the hundreds of saddles that were made in a year. This provided the highest quality workmanship and kept the saddle-maker linked to every saddle that left his shop. Most of his saddles had small rounded skirts and long one-piece tapaderos, which became characteristic of many G.S. Garcia saddles. 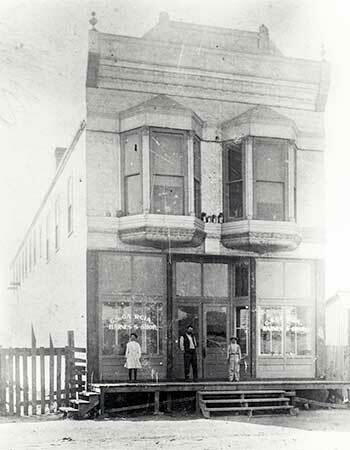 The 1900 Elko census indicated that there were 12 gear-makers employed at the shop. By 1902, the number of employees ranged from 10 to 15. All were paid a better than average wage. John Estrada, who had been hired by G.S. several years earlier, continued his apprenticeship under Alsalio Herrera, the master silver-worker who was in charge of the silver department. By 1902, Paul Adams was added to the apprentice rolls and began to learn the fine art of silver engraving. G.S. was not only hiring to meet the needs of his current market base; he and Saturnina had a bigger plan in mind. The couple had learned that there was to be a World’s Fair Exposition held in St. Louis, Missouri beginning in May of 1904 and running through December. They decided that G.S. Garcia Harness and Saddlery was going to participate in a big way. G.S. had a four-fold plan. First, the shop must have enough inventory on hand to meet the needs of its customers while G.S. and others were gone to the fair. Saturnina would attend as well. Second, they needed to produce some of their finest saddles, bits, spurs, silver work, and horsehair and rawhide gear to put on display. Third, some of their most skilled craftsmen would need to attend the fair to demonstrate their techniques to fair on-lookers. And, finally, they would create the most beautiful saddle, headstall, reins, martingale, and bit ever produced to enter into the World’s Fair competition. In order to accomplish all this, they needed to have even more skilled craftsmen. G.S. was ahead of his time in that he sought people with great skill, including women. 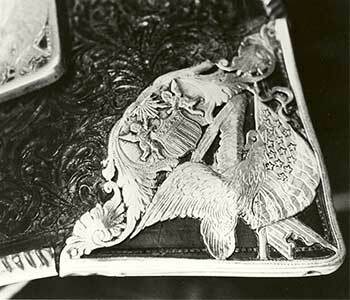 He hired Miss Susie McDonald, an expert engraver, to work with Alsalio Herrera in the silver department. In 1903, gender equity did not exist in many places but, in the Garcia Harness and Saddlery, it was skill that counted. Miss McDonald worked side-by-side with the men in the shop as they prepared for the World’s Fair. G.S. hired Domingo Aguilar, who had great skill in making braided rawhide and calfskin headstalls and reins to making the gear for the special new saddle. 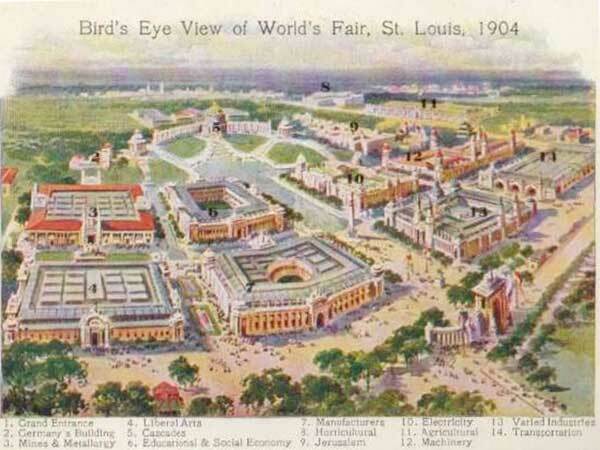 As the summer of 1903 wore on, plans for the St. Louis Exhibition and World’s Fair were solidified. Work on several saddles had begun and tanned hides were being examined for use in the competition saddle. The shop was even more a beehive of activity than usual. G.S. began cutting the leather for all of the saddles, but special attention was given to the one to be entered in the competition. Unlike many of the Garcia saddles, its skirts were not to be small and rounded; they were cut from the finest tanned leather and would be large, rectangular, and black in color. G.S. selected the American Beauty rose pattern to be the primary design on most of the leather pieces. The seat, however, was to be “inlaid” with a different pattern and had cushioning to provide a more comfortable ride. The leather carving and stamping began. Each piece was thoughtfully considered and artistically executed. By December of 1903, Nevada’s governor John Sparks, who also was from Elko County, became aware of G.S.’s plans for his entry in the St. Louis World’s Fair. He wrote to G.S. 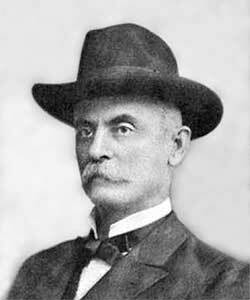 complementing him on his “enterprising spirit and wishing him success in his great undertaking.” Governor Sparks also offered to “secure for him all the room needed for his exhibit in the Nevada State Building” which was being constructed. As G.S.’s plans for the saddle continued to take shape, he moved from craftsmanship to artistry. He produced a piece of three-dimensional working art. 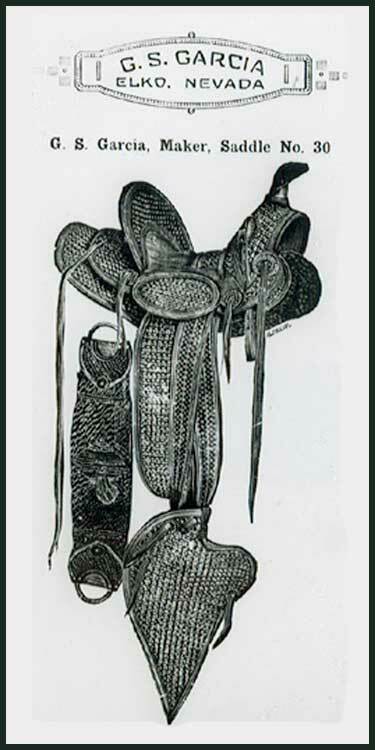 The themes worked in silver and gold and set into the saddle would represent both Nevada and the United States as a whole. 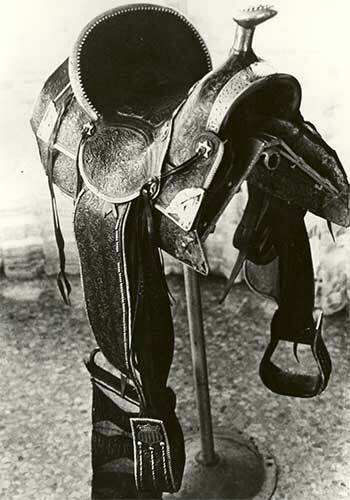 This saddle was in a world competition, and Garcia Harness and Saddlery would carry on its shoulders the reputations of Elko, the State of Nevada, and the United States of America. 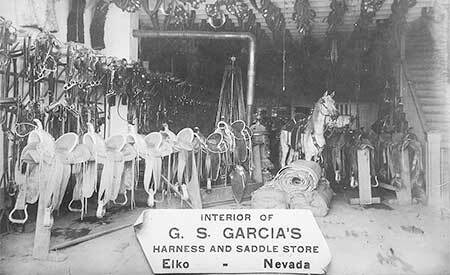 By the start of 1904, the G.S Garcia Harness and Saddlery would be one of Elko’s largest employers with 20 individuals working to produce “everything for the vaquero.” In addition, the extensive detail work for the saddle was in full swing. G.S. was personally involved in each aspect of design and implementation. Alsalio Herrera and his colleagues in the silver department were focused on perfecting the extensive silver and gold ornamentation. John Estrada and Mike Morales, along with others, were involved in making the bit and mouthpiece. Domingo Aguilar was busy creating the braided calfskin headstall and reins, which were to be no thicker than a quarter inch in diameter. The bit-maker carved and engraved a large eagle clutching an American flag chevron. Even the feathers of the eagle were done in detail. 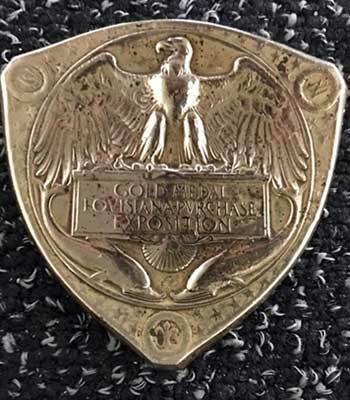 At the eagle’s wing tips was a decorative silver concho with the word “NEVADA” above it. On the cross bar of the bit was a spread eagle whose talons gripped an American flag chevron. Decorations on the bit embodied the dominant themes of the whole saddle, which was to represent both Nevada and the United States at the World’s Fair. The martingale’s beautiful leather was studded with silver carved medallions that echoed the theme and figures found throughout the gear. At its center was a large silver hand-carved eagle with its wings open wide. The saddle skirts and fenders were all edged in silver while the corners of the skirts and upper skirt each had a hand-carved, three-dimensional figure. These were large decorations and today would be cast silver, but G.S. had each figure hand-carved in full detail. Their themes continued in a patriotic design, including an eagle holding a U.S. flag mounted by finely carved cherubs holding an American flag with a sunrise background. On the upper skirts, a hand carved bear topped the flag-bearing eagles. On the back of the silver edged cantle was a large six- to seven-inch wide carved silver eagle with its wings spread wide, clutching a globe. G.S. decided not to have tapaderos, choosing instead to adorn the stirrup with the same silver edging used on the skirts. The leathers were also stamped in the American Beauty rose pattern, with three silver ropes originating from the base of an American flag shield. The pommel was decorated with a two and a half-inch wide band of carved silver open work, at the center of which is the hand-carved Great Seal of the State of Nevada. The carving of the seal accurately contained a mine on the left with a horse drawn wagon in front and smelter on the right. The front of the seal showed a hand-drawn plow in front of a scythe and a sheaf of wheat. In the background were mountains surmounted by a rising sun, in front of which was a coal-powered train traversing a trestle between two hills. Other elements represented Nevada’s scenery and its mining and agriculture industries, while the train demonstrated the importance of the railroad in this wide-open state. The most distinctive aspect of the saddle’s decoration was what G.S. decided to put behind the fork. Directly behind the horn was a 20 dollar gold piece carved in the likeness of U.S. President Theodore Roosevelt. To the left was another 20 dollar gold piece carved with the head of Nevada’s first governor William Nye. 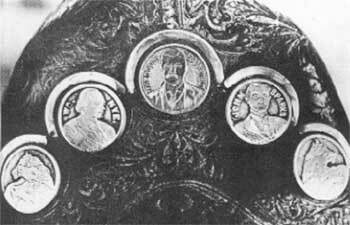 To the right of center was a third 20 dollar gold piece carved in the likeness of John Sparks, the Governor of Nevada in 1904. On the outer side of the two governors were two more gold pieces carved with three horse heads, sometimes called faerie horses. Diamonds were set in their eyes, lending elegance as well as beauty. Traditionally, faerie horses are examples of effortless perfection and are as fleet as the wind. Two more of these carved horse head medallions were on the martingale. Completing the arc of carved gold pieces behind the fork was a hand-carved, five-pointed star. The star theme was also echoed on the elegant conchos. This was not just a decorative piece; it was a working saddle that was elaborate, beautiful, and overpowering in its artistry, integrity, and elegance. To complete the total effect was the calfskin headstall with ferrules that were half gold and half silver. The slides were hand-forged silver snakes. A concho on the headstall showed a carving of a faerie horse whose eyes were set in rubies. Gareino’s fine woven horsehair cinch, with rings inlaid with the design of a silver snake, finished off the months long creative effort. By April 1904, they were ready. Everything was loaded onto the train for the nearly 70-hour trip to St. Louis, Missouri. The G.S. Garcia Harness and Saddlery exhibit was located in the Nevada State Building in the Transportation, Saddlery & Harness division. Reports indicate that as the G.S. Garcia products were being unloaded and placed in the exhibit, some saddle-makers and engravers “packed up and left,” fearing they would never be able to compete with the intricate carving of the work that G.S. displayed. Twenty million people visited the St. Louis World’s Fair and Exhibition before it closed on December 1. By its end, the fame and name of the G.S. 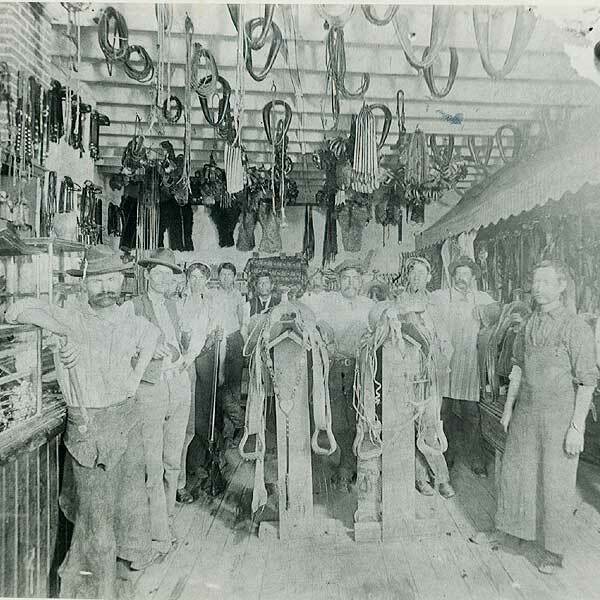 Garcia Harness and Saddlery had spread across the nation and around the world. Equally important, G.S. took many orders for custom saddles. One such order came from an unknown cowboy humorist, Will Rogers, who had to pay for his saddle by making payments. As the years passed, Will Rogers, no longer had to pay for things over time, but he ordered two more saddles from G.S. Garcia, whose fortune had also increased dramatically. The year 1905 began with everyone working full speed to fill the orders that resulted from the increased exposure in St. Louis, Missouri. But G.S. and Saturnina had other plans as well: there was to be another large exposition — this time in Portland, Oregon — that would mark the centennial of the Lewis and Clark expedition across America. The Lewis and Clark Centennial World’s Fair and Exposition would begin in June 1905, and conclude October 15, 1905. Of course, the Garcia Harness and Saddlery would participate. The next several months were spent making beautiful, carved and stamped leather goods and creating silver bits and spurs. Saturnina was sent ahead to Portland, Oregon to make the exhibit arrangements. They needed space to show their finished products and an area to demonstrate techniques used to make them. Saturnina and G.S. wired each other about the final details to ensure that the appropriate space was secured. They would take the prize-winning saddle from the St. Louis World’s Fair to this exposition as well. By the middle of October 1905 and the close of the Lewis and Clark Exposition and World’s fair, G.S. Garcia was notified that his already famous saddle had won two more gold medals. His was the only saddle to win two gold medals, assuring him a spot in history and securing his future finances. G.S. began to capitalize on the fame of the gold medal-winning saddle. Photos were taken of it on the back of a life-size, papier-mâché horse that he made for the saddle. The pictures were made into postcards and used in newspaper advertisements. 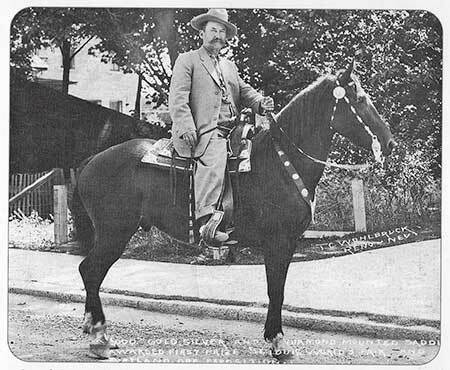 The saddle was often called “the gold medal saddle” or “the $5,000 dollar saddle.” Utilizing his good sense for marketing, the pictures were included in the G.S. 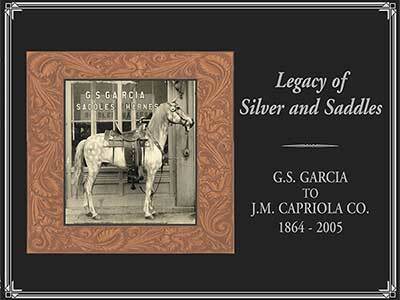 Garcia Harness and Saddle Shop catalogues, along with pictures of the gold medals it had won. On January 10, 1910, the Elko Free Press reported, “Elko has one of the finest mail order houses in the United States, G.S. 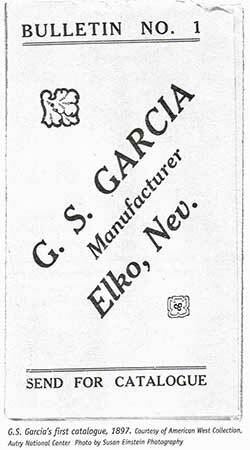 Garcia.” Saddles, bits, spurs, and other gear were being shipped all over the nation. By the close of the decade, horsemen knew that if they sought a comfortable ride for themselves and their horse, and they wanted fine craftsmanship, then the G.S. Garcia Harness and Saddlery was the place to turn. Working buckaroos, vaqueros, and cowboys thought nothing of spending a year’s wages to own a Garcia saddle, bit, or a pair of spurs. These were the bread and butter for the business, but they also carried “everything for the vaquero,” including sidesaddles for women, wooly chaps, and other specialty items. Because of his marketing strategies and the finely created catalogue, G.S. filled orders from as far away as Argentina, Canada, Mexico, Australia, and France. The customer base in France developed because of the French-Basque sheep men who lived in and around Elko. G.S. became acquainted with them especially when he also became a sheep owner. As the local Basques purchased Garcia saddles for themselves, their families and friends in France came to associate G.S. Garcia Harness and Saddlery with high quality and soon began to order saddles for themselves. 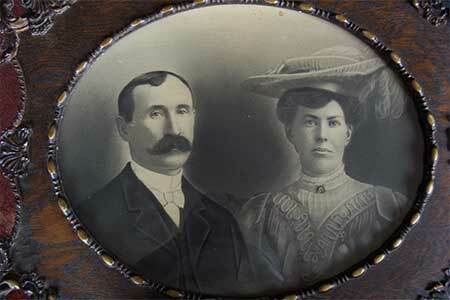 Both business and life in general were good for the Garcias of Elko. Their home was full of laughter and children. Jokes and good-natured teasing were part of everyday life with Saturnina and G.S. being full participants. The future appeared bright.